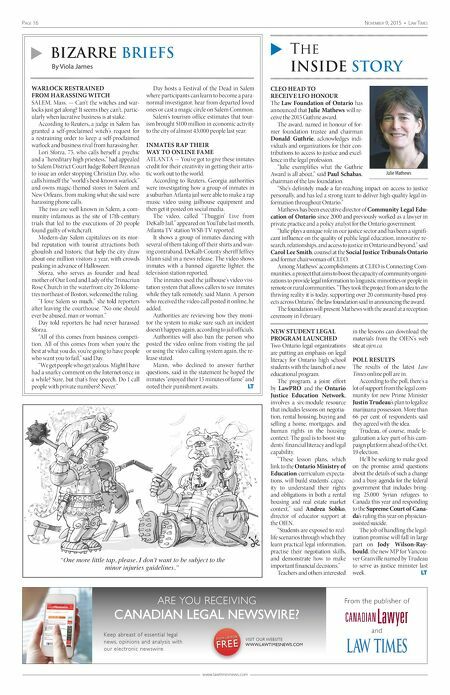 Page 16 November 9, 2015 • Law Times www.lawtimesnews.com CLEO HEAD TO RECEIVE LFO HONOUR The Law Foundation of Ontario has announced that Julie Mathews will re- ceive the 2015 Guthrie award. The award, named in honour of for- mer foundation trustee and chairman Donald Guthrie, acknowledges indi- viduals and organizations for their con- tributions to access to justice and excel- lence in the legal profession. "Julie exemplifies what the Guthrie Award is all about," said Paul Schabas, chairman of the law foundation. "She's definitely made a far‐reaching impact on access to justice personally, and has led a strong team to deliver high-quality legal in- formation throughout Ontario." Mathews has been executive director of Community Legal Edu- cation of Ontario since 2000 and previously worked as a lawyer in private practice and a policy analyst for the Ontario government. "Julie plays a unique role in our justice sector and has been a signifi- cant inf luence on the quality of public legal education, innovative re- search, relationships, and access to justice in Ontario and beyond," said Carol Lee Smith, counsel at the Social Justice Tribunals Ontario and former chairwoman of CLEO. Among Mathews' accomplishments at CLEO is Connecting Com- munities, a project that aims to boost the capacity of community organi- zations to provide legal information to linguistic minorities or people in remote or rural communities. "They took the project from an idea to the thriving reality it is today, supporting over 20 community‐based proj- ects across Ontario," the law foundation said in announcing the award. The foundation will present Mathews with the award at a reception ceremony in February. WARLOCK RESTRAINED FROM HARASSING WITCH SALEM, Mass. — Can't the witches and war- locks just get along? It seems they can't, partic- ularly when lucrative business is at stake. According to Reuters, a judge in Salem has granted a self-proclaimed witch's request for a restraining order to keep a self-proclaimed warlock and business rival from harassing her. Lori Sforza, 75, who calls herself a psychic and a "hereditary high priestess," had appealed to Salem District Court Judge Robert Brennan to issue an order stopping Christian Day, who calls himself the "world's best-known warlock" and owns magic-themed stores in Salem and New Orleans, from making what she said were harassing phone calls. The two are well known in Salem, a com- munity infamous as the site of 17th-century trials that led to the executions of 20 people found guilty of witchcraft. Modern-day Salem capitalizes on its mor- bid reputation with tourist attractions both ghoulish and historic that help the city draw about one million visitors a year, with crowds peaking in advance of Halloween. Sforza, who serves as founder and head mother of Our Lord and Lady of the Trinacrian Rose Church in the waterfront city 26 kilome- tres northeast of Boston, welcomed the ruling. "I love Salem so much," she told reporters after leaving the courthouse. "No one should ever be abused, man or woman." Day told reporters he had never harassed Sforza. "All of this comes from business competi- tion. All of this comes from when you're the best at what you do, you're going to have people who want you to fail," said Day. "We get people who get jealous. Might I have had a snarky comment on the Internet once in a while? Sure, but that's free speech. Do I call people with private numbers? Never." Day hosts a Festival of the Dead in Salem where participants can learn to become a para- normal investigator, hear from departed loved ones or cast a magic circle on Salem Common. Salem's tourism office estimates that tour- ism brought $100 million in economic activity to the city of almost 43,000 people last year. INMATES RAP THEIR WAY TO ONLINE FAME ATLANTA — You've got to give these inmates credit for their creativity in getting their artis- tic work out to the world. According to Reuters, Georgia authorities were investigating how a group of inmates in a suburban Atlanta jail were able to make a rap music video using jailhouse equipment and then get it posted on social media. The video, called "Thuggin' Live from DeKalb Jail," appeared on YouTube last month, Atlanta TV station WSB-TV reported. It shows a group of inmates dancing with several of them taking off their shirts and wav- ing contraband, DeKalb County sheriff Jeffrey Mann said in a news release. The video shows inmates with a banned cigarette lighter, the television station reported. The inmates used the jailhouse's video visi- tation system that allows callers to see inmates while they talk remotely, said Mann. A person who received the video call posted it online, he added. Authorities are reviewing how they moni- tor the system to make sure such an incident doesn't happen again, according to jail officials. Authorities will also ban the person who posted the video online from visiting the jail or using the video calling system again, the re- lease stated. Mann, who declined to answer further questions, said in the statement he hoped the inmates "enjoyed their 15 minutes of fame" and noted their punishment awaits. LT ARE YOU RECEIVING CANADIAN LEGAL NEWSWIRE? Keep abreast of essential legal news, opinions and analysis with our electronic newswire. VISIT OUR WEBSITE WWW.LAWTIMESNEWS.COM SIGN UP FOR FREE From the publisher of and CLNW_LT_Nov2_15.indd 1 2015-10-28 8:33 AM u Bizarre Briefs By Viola James u The InsIde story NEW STUDENT LEGAL PROGRAM LAUNCHED Two Ontario legal organizations are putting an emphasis on legal literacy for Ontario high school students with the launch of a new educational program. The program, a joint effort by LawPRO and the Ontario Justice Education Network, involves a six-module resource that includes lessons on negotia- tion, rental housing, buying and selling a home, mortgages, and human rights in the housing context. The goal is to boost stu- dents' financial literacy and legal capability. "These lesson plans, which link to the Ontario Ministry of Education curriculum expecta- tions, will build students' capac- ity to understand their rights and obligations in both a rental housing and real estate market context," said Andrea Sobko, director of educator support at the OJEN. "Students are exposed to real- life scenarios through which they learn practical legal information, practise their negotiation skills, and demonstrate how to make important financial decisions." Teachers and others interested in the lessons can download the materials from the OJEN's web site at ojen.ca. POLL RESULTS The results of the latest Law Times online poll are in. According to the poll, there's a lot of support from the legal com- munity for new Prime Minister Justin Trudeau's plan to legalize marijuana possession. More than 66 per cent of respondents said they agreed with the idea. Trudeau, of course, made le- galization a key part of his cam- paign platform ahead of the Oct. 19 election. He'll be seeking to make good on the promise amid questions about the details of such a change and a busy agenda for the federal government that includes bring- ing 25,000 Syrian refugees to Canada this year and responding to the Supreme Court of Cana- da's ruling this year on physician- assisted suicide. The job of handling the legal- ization promise will fall in large part on Jody Wilson-Ray- bould, the new MP for Vancou- ver Granville named by Trudeau to serve as justice minister last week. LT Julie Mathews "One more little tap, please. I don't want to be subject to the minor injuries guidelines."